加燦 指指點點 | A Canadian writes about things he sees. What an insightful and well made documentary! “The appointment of Larry Kudlow to head the National Economic Council epitomizes the phenomenon. The NEC director doesn’t have to be an academically prestigious economist; Larry Summers was an exception. But under Obama the director was always someone who was interested in real policy research, listened to what experts had to say, and was willing to change views in the face of evidence. 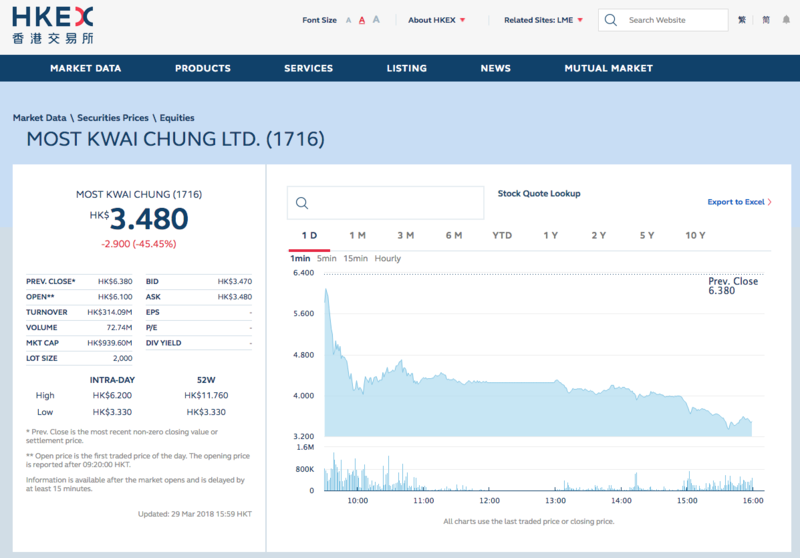 It is too early to judge the long term performance of 毛記葵涌 Most Kwai Chung (01716) HKEX but the trading activities and closing price (closed at $3.480, drop $2.9 or 45.45% from previous day closing) on its 2nd trading day (March 29th, 2018) after its March 28th listing date isn’t that auspicious to say the least. “Hong Kong media firm Most Kwai Chung, which runs popular satirical magazine 100Most and a digital media site tapping into Hong Kong’s youth culture, saw its stock soar as much as tenfold on its trading debut after attracting the most public subscriptions for an IPO in Hong Kong history. Most Kwai Chung opened at HK$8.40 on Wednesday morning and quickly shot up to HK$11.76, 10 times its IPO price of HK$1.20. It closed at HK$6.38, with 185 million shares having changed hands. With a current market cap of HK$1.7 billion, the company is more valuable than a slew of established media companies in Hong Kong, including Sing Tao News Corporation, i-Cable Communication, Hong Kong Economic Times Holdings and Next Digital.